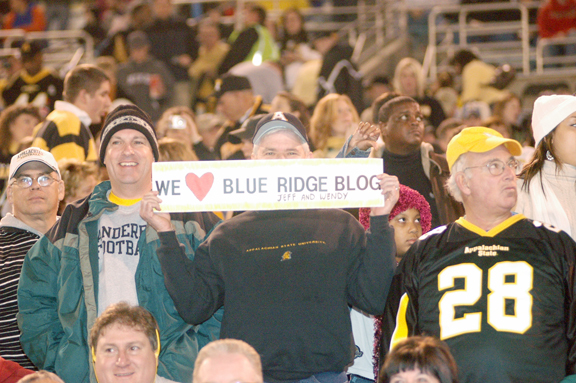 3 signs were raised in support of Blue Ridge Blog. To me this means that there are at least 3 people in this whole wide world who first, read this blog, understand my sense of humor and then are proactive enough to make me smile. Of course, before I mention a word about the game, I will keep my WORD to them. Do understand I have been awake for nearly 22 hours so any minute now this post will die. Thank all 3 of you so much. It makes my job so much more fun with y'all around. Really. And if you don't know who won by now, I'm not sure it is worth the bother, but ASU 28 UMass 17.